If we talking about competition with world-class brand Franchisor, Babarafi proved its work with 1300 outlets in 8 countries. Experience, skill management and a strong marketing team make Brand Baba Rafi always the most popular franchise business. The delights and quality of kebabs are highly sought after by customers from the family, youth and children segment. In addition to filling Kebab Babarafi is a healthy and hygienic menu. Babarafi expanded its business in many foreign countries such as Malasia, Singapore, Brunei, philipine, china, bangladesh and dutch. Due to the high market demand, We launched the Container Kebab Café by Baba Rafi to answer the customer’s request to linger in Container Kebab by Baba Rafi. Apparently this kebab business still has the potential to continue to grow considering the market is still quite open and there has been no direct competitors and affordable franchise prices. 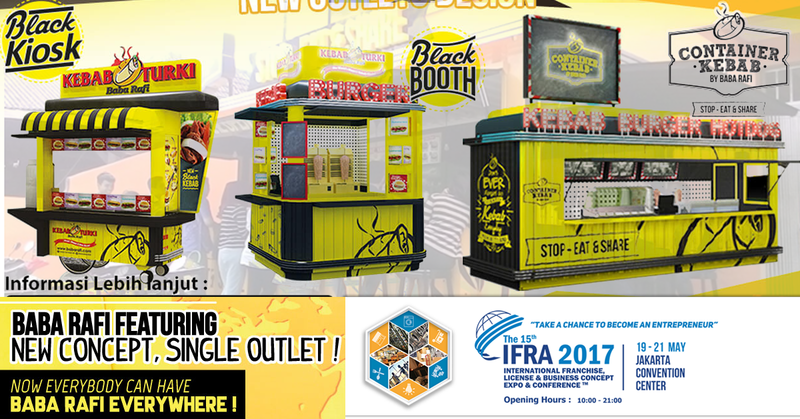 If you are interested in opening a Container Kebab Cafe business by Baba Rafi you can attend the big event of International Franchise License & Business Concept Expo & Conference (IFRA) 2017. The event took place on 19 – 21 May 2017 at the Jakarta Convention Center (Senayan – Jakarta). The conference was filled by 100 speakers from around the world on Business model and how to start a good business. Visit Baba Rafi booth, you will be helped introduced and given the ease of joining the business of Franchise Kebab Baba Rafi. How do I apply to become a Master Franchisor in my area?Please contact us through the contact form or email info@babarafi.com. We will then discuss the opportunity during a phone or skype call. After that we will extend an invitation to visit our headquarters in Jakarta.